Denzil Waugh, son of Clyde & Clara Belle (Motsinger) Waugh, was born Nov. 26, 1923 at Redding, Iowa. 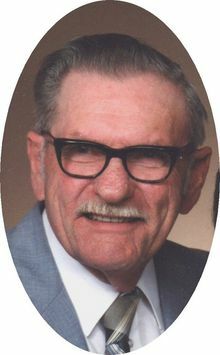 Denzil graduated from Mount Ayr High School and served his country during World War II. He married Socorro Pulido on June 16, 1956 in Des Moines, Iowa. He lived several years at Redding before moving to Benton in 1985. Denzil operated an electronics repair business in Redding and Grant City. He was a member of the Hickory Grove Advent Christian Church, C.A. Herrington Post #617, American Legion in Redding, and the I.O.O.F. Denzil passed away suddenly on Jan. 12, 2007 in Des Moines. He was preceded in death by his parents; mother-in-law Maria Ramirez; brother Eldred Waugh; sister Vincel Elder; Sister-in-law Pauline Barber; brother-in-law Stewart Elder; niece Mary Dossey. Survivors include his wife Socorro of Benton; son Eugene & wife Linda Waugh of Benton; daughter Martha Ricker & husband Brent of Mt. Ayr; grandchildren Dana Waugh, Jessie Ricker, Jake Ricker, Joe Ricker, and Randy Lear.